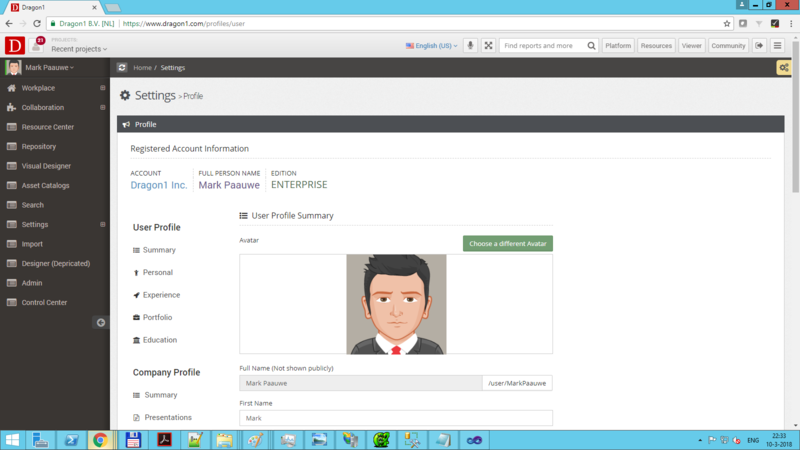 You are a Business Professional and you can create a profile for yourself on Dragon1. With this profile you promote yourself within your organization or on the web, for instance, to get a new project to work on, alone or with others. Below you see a screenshot of a user profile that is made public and indexable by search engines, such as Google. Go to your User information via the Menu by clicking on Settings and then click on User. Here you can select an avatar as user photo, or upload a new picture for your user photo. You can provide a name here for your profile, which is also a handle to be referenced within messages. You can provide a secondary email address to log in. If you want your full personal name or primary username to be changed, you will have to contact the service desk. Now click on a section within the User Profile to get the form for that section. If you want to make use of the portfolio section, of course you first need to create visualizations in the Visual Designer. Click on save to save your data. You may choose if your profile is hidden, not available, not indexed or visible for your colleagues or visible to everyone. If you set your profile to Public, your profile will be indexed in Google and anyone who visits Dragon1.com can look at your profile. Also, your name and avatar will show up on the user's page. If you set your profile to NoIndex, your profile will be public, but not be indexed in Google*. If you set your profile to Private, it cannot be accessed by people who are not logged into your Dragon1 account (meaning the same company). Also, your name and avatar will not show up on the users page. Check after a few days if your profile has been indexed in Google. If it's not, please contact us via servicedesk@dragon1.com. This is a future option and will become available anytime. If you make sure your profile communicates your skills correctly, people will start to send you a question on a topic via your profile page. Your email address is not provided, so it is safe and secure for you. You can switch off this option on the privacy page. This is an example screenshot of a published user profile. 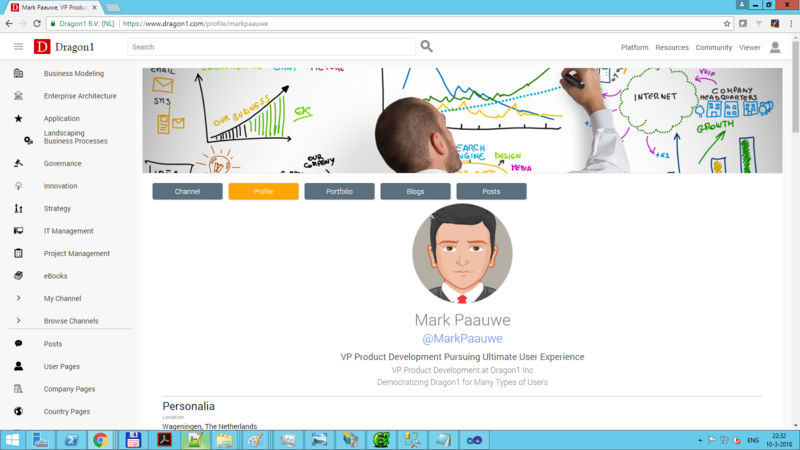 This is an example screenshot of the user profile setup pages. We never can guarantee your profile will not be indexed by Google or another search engine. Search engines provide commands to use to tell a page should not be indexed, but it is not guaranteed that it will not index the page.